With the advent of ADAS and autonomous vehicles, there is need for a system which can assist the driver in the driving process and make it easier for the driver to travel without worrying about the safety and control issues while driving. However, ADAS and driverless vehicles work on the input provided by automated systems, therefore, necessitating the need for more accurate and dense data provided to the system. Cameras/RADARs/ultrasonic sensors are unable to meet these sensing requirements due to various operational limitations of these sensors, which in effect, raises the need for the usage of Light Detection and Ranging (LiDARs) for a higher level of automation. The global automotive LiDAR market is anticipated to grow at a significant rate during the forecast period 2018-2028. The high growth rate in the volume of LiDARs is predicted due to rising customer demand, extensive usage of LiDARs in high-level automated vehicles, tremendous development in the Research & Development (R&D) for automotive LiDAR to enhance the features of the LIDAR system, and an anticipated decline in manufacturing prices of LiDARs after the commencement of mass production. The demand for automotive LiDAR varies according to various geographical regions. The automotive LiDAR market holds a prominent share in various countries of North America, Asia-Pacific (APAC), Europe, and Rest-of-the-World (RoW). Geographically, U.S. led the global automotive LiDAR market in 2017 in terms of value as the U.S. market had a major share in the global automotive LiDAR market for the year 2017. The presence of major LiDAR manufacturers and automakers such as Ford Motors Company, General Motors, Velodyne LiDAR, Inc., and Quanergy Systems, among others, as well as advancements in the number of highly automated vehicles accounts for the high growth rate and major share of the U.S. in the automotive LiDAR market. Also, the growing demand of automotive LiDAR from the U.S. provides immense opportunities to players in the supply chain. For instance, it is expected that LiDAR component suppliers will play a significant role by collaborating with LiDAR manufacturers, in reducing the time required to mass produce LiDAR systems for the automotive market. Additionally, APAC region is expected to witness one of the highest growth rates during the forecast period (2018-2028) owing to various factors such as government implementation towards upgradation of existing vehicles to ADAS and autonomous vehicles which uses LiDAR systems, high demand due to advancement in technology, and greater adaptation of autonomous vehicles and safety sensors such as LiDARs in these vehicles due to decreased cost. The global automotive LiDAR market has witnessed several strategic and technological developments in the past few years, undertaken by the different market players to attain their respective market shares in this emerging domain. Some of the strategies covered in this section are product launches, partnerships and collaborations, and mergers and acquisitions. The preferred strategies for the companies have been partnerships and collaborations along with new product launches in order to strengthen their position in the global automotive LiDAR market. 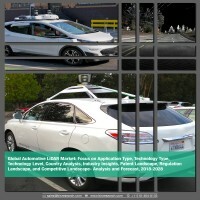 The key market players in the global automotive LiDAR market are Continental AG, Ibeo Automotive Systems GmbH, Garmin Ltd, Infineon Technologies, Innoviz Technologies, LeddarTech, Quanergy Systems, Inc., Phantom Intelligence, and Velodyne LiDAR, Inc., among others. • What will be the global automotive LiDAR market value by 2028 along with the estimated CAGR? • What are the driving factors for the global automotive LiDAR market through 2017 to 2028? • Which factors are hindering the growth of the global automotive LiDAR market? • What are the recent trends and developments in the global automotive LiDAR market? • Which automotive LiDAR type will lead the global automotive LiDAR market by 2028? • What is the revenue generated by automotive LiDAR across different application verticals during the forecast period (2018-2028)? • Which application will dominate the global automotive LiDAR market by 2028? • Which level of autonomous vehicle will dominate the global automotive LiDAR market by 2028? • Which region will lead the global automotive LiDAR market by 2028? • What is the patent landscape scenario for automotive LiDAR market? • What is the direction of pricing of automotive LiDARs by 2028? • What is the regulation landscape for autonomous vehicles and LiDAR systems? • Who are the regulating bodies in charge of regulations related to autonomous and self-driving vehicles by 2028? • What is the supply chain scenario for the automotive LiDAR market? • What is the technology trend and roadmap related to autonomous vehicles and automotive LiDARs by 2028? 11.12 Quanergy Systems, Inc. Inc. The global automotive industry is experiencing a huge surge of technological advancements and evolution since its origin in the nineteenth century. Many prospects for growth in the market are being created due to the convergence of various emerging technologies in the industries within the automotive ecosystem such as driverless vehicles, advanced vehicle sensors, and connected vehicle technologies, among others. This has now led to the advent of Advanced Driver Assist Systems (ADAS) for automobiles. These systems are intended to assist the driver in the driving process and make it easier for the driver to travel without worrying about the safety and control issues while driving. ADAS is expected to pave its way through semi-autonomous vehicles and ultimately, towards fully-automated vehicles. There has been a growing number of vehicle-related on-road fatalities because of the increasing number of vehicles on the road, and such incidents are bound to increase in the coming years. Perceiving this lack of safety in vehicles and driving process, there is a massive demand for ADAS features and functionalities in a vehicle in the current automotive market. However, ADAS and driverless vehicles work on the input provided by automated systems, therefore, necessitating the need for more accurate and dense data provided to the system. Cameras/RADARs/ultrasonic sensors are unable to meet these sensing requirements due to various operational limitations of these sensors, which in effect, raises the need for the usage of Light Detection and Ranging (LiDARs) for a higher level of automation. LiDAR devices use pulsed laser beam in order to calculate the distance of obstacles from any vehicles by emitting laser beams. The distance is measured by analyzing the time taken by the laser pulse to reflect and receive the sensors at receiving end. LiDAR sensors are used to scan the environment with a non-visible and non-harmful laser beam, which is used to visualize objects and measure ranges and create a 3D image of the vehicle’s environment. A LiDAR sensor has various advantages over other sensor systems such as a better range, field-of-view, accuracy, positioning, weather conditioning, and night-time performance among others. A LiDAR vehicle can also be used for various purposes apart from usage in the automotive industry such as for industrial topography, robotics, mining, military, surveying, and agriculture among others. It has been observed that the automotive LiDAR industry is experiencing rapid growth. The global automotive LiDAR market is driven due to various factors influencing the market such as the increasing adoption of autonomous vehicles by automotive OEMs, the growing safety concerns in the automotive ecosystem, and the high investments in the recent years by various investors and companies. The eventual increase in acceptance by OEMs for using LiDARs in autonomous vehicles is expected to facilitate a higher growth rate for the automotive LiDAR market. There are also various challenges which currently hinder the growth of the LiDAR market such as high prices of automotive LiDARs, and the complex design and development of LiDAR safety systems among others. At the same time, automotive LiDAR market, being at early stage, provides several opportunities for both LiDAR and semiconductor chip manufacturers for further growth and innovation such as the prospect of being an early market-entrant and a market leader in the automotive-grade LiDAR segment, which is yet to be fully explored by many LiDAR companies, among others. Automotive LiDARs are available in different types depending on the technology. The two most prominent ones are mechanical and solid-state LiDAR. The automotive LiDAR industry is witnessing a shift in the trend from mechanical automotive LiDARs to solid-state automotive LiDARs, due to the wide range of advantages offered by solid-state automotive LiDARs over mechanical automotive LiDARs. Solid-state LiDARs tend to be compact, hence, can be easily integrated into self-driving vehicles. Furthermore, with technological developments in fixed laser beam devices and elimination of mechanical parts, automotive LiDAR manufacturing companies may avoid the huge cost associated with the production of components of mechanical LiDAR, therefore, leading to a reduction in the overall production cost of automotive LiDAR solutions. Depending upon the levels of automation- level 2 (partial automation), level 3 (conditional automation), level 4 (high automation) and level 5 (full automation), different types of LiDARs are integrated into vehicles. The market is expected to have a prominent presence of LiDARs for level 4 and 5 automation, due to rising demand for level 4 and 5 automotive LiDARs as various OEMs and companies will begin to introduce level 4 and 5 vehicles which would have more LiDAR sensors in those automotive systems, but the majority remains with level 3 automation. Geographically, U.S. led the global automotive LiDAR market in 2017 in terms of value as the U.S. market had a major share in the global automotive LiDAR market for the year 2017. Factors such as the presence of major LiDAR manufacturers and automakers such as Ford Motors Company, General Motors, Velodyne LiDAR, Inc., and Quanergy Systems, among others, as well as advancements in the number of highly automated vehicles accounts for the high growth rate and major share of the U.S. in the automotive LiDAR market. Also, the growing demand of automotive LiDAR from the U.S. provides immense opportunities to players in the supply chain. For instance, it is expected that LiDAR component suppliers will play a significant role by collaborating with LiDAR manufacturers, in reducing the time required to mass produce LiDAR systems for the automotive market.